Have you ever asked, "What on earth am I here for?" You are not an accident! Even before the universe was created, God had you in mind, and He designed you for five purposes. 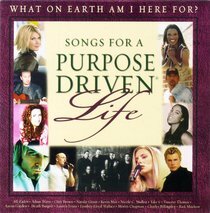 The 12 songs on this album express God's purposes for your life, as explained in Rick Warren's best-selling book, THE PURPOSE DRIVEN LIFE. These passionate songs, by top Christian artists, will support you in discovering and living out God's purposes for your life. They can also be used with the 40-day spiritual journey described in THE PURPOSE DRIVEN LIFE. About "Songs For a Purpose Driven Life"